When homeowners can’t decide between leaving a house as is or going full out for the holidays, there’s a compromise: reasonable holiday décor that defines interior spaces while maximizing twinkle and fun. Decorations can add a sense of tradition and family — and a punch of color — to your house or apartment. Begin by looking at the interior of your home and determining what is crying out for decoration. Maybe it is that plain oak staircase or the fireplace mantle. For the mantlepiece, remove those baseball trophies for a month and replace them with holiday objects. Use a Menorah and silver for Hanukkah, or red and green for Christmas followed by silver and gold for New Year’s Eve. Now, about that staircase. 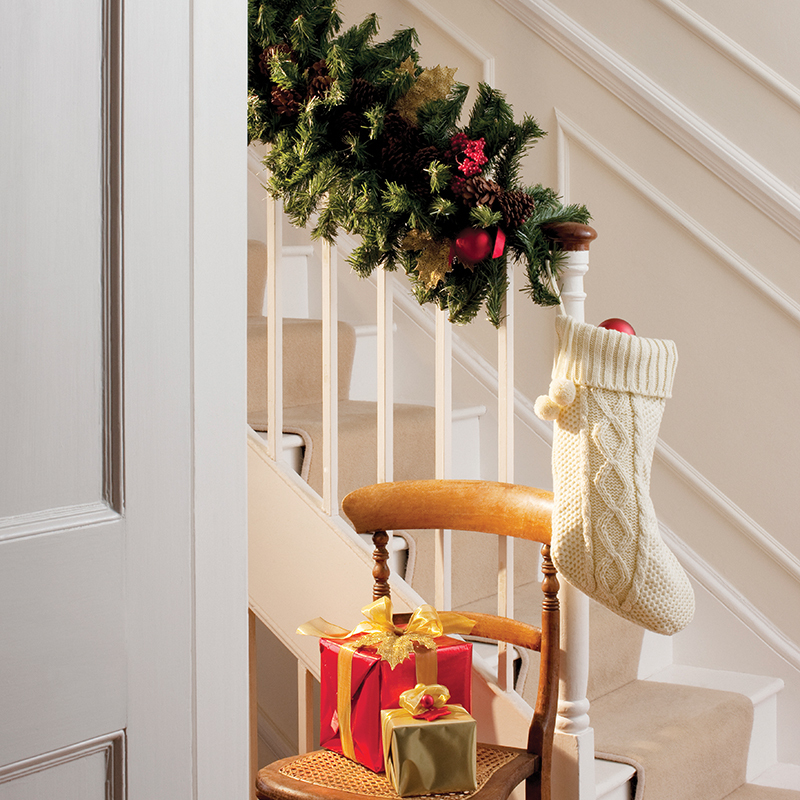 Use artificial greenery to wrap around the banister. For a party, have a nursery or florists come in and work their magic. Place giant poinsettias at the base of the staircase or in the middle of a large polished coffee table. The color of the plants and the wrapping paper matters — if you have a turquoise, charcoal gray or lavender room, then white and silver work best. For most other color schemes, traditional shiny gold, evergreen or red wrapping paper stand out. Displays at area gift stores, florist shops and nurseries can inspire. Beautiful live trees smell wonderful. Historic homes and cottages open to the public such as the 1871 Greek Revival Dorr House and 1890 Victorian home in the Historic Pensacola Village provide decorating ideas and the chance to see how the original owners set their holiday tables. Combine a walk through the village with ice cream at the nearby Dolce & Gelato or shopping for gifts at the Pink Market boutique or a swig of holiday beer at the charming brick Pensacola Bay Brewery. As to scents, gift stores carry the popular Thymes Frasier Fir line that includes diffusers, candles, room spray, dish soap, all-purpose cleaner and handwash. Nest Fragrance has three different holiday scents. Coordinate the scents with holiday table linens and decorative napkins. Don’t forget to dig into your linen closet for those festive reindeer towels and boxes of guest soaps. Just like at the Historic Pensacola Village, home decorations can be pulled in and out of boxes and stored each year. If neutral enough, of course, they may be placed on permanent display. A case in point is a giant piece of crystal, perfect as a statement piece for the foyer or a formal dining room table. White quartz is often used in its most utilitarian form, serving as a base material to build countertops or other solid surfaces. But incorporating large pieces such as those by White Quartz into design projects is a concept familiar to interior designers. Displaying high-quality crystal in a foyer or entrance will deliver an unexpected but alluring presence to be admired as a natural and grand work of art. It can remain year-round unembellished on a tabletop or for the holidays on a mirrored finish or cloth base of red, green, bright blue, silver or gold. For do-it-yourself foyer decorations, scavenge an evergreen branch from your backyard or make a simple arrangement from Christmas tree trimmings, real or artificial. Perhaps you already have a large clam shell. Fill it with shiny glass or silk covered ornaments or a piece of driftwood trimmed with lights or ribbons. Another trick is to use houseplants and potted trees. Polish the leaves, and move the plants around. There’s plenty for the innovative green thumb to do during this happy time of year. Is this your first or second holiday season in your home or with a new blended family? Traditional touches give a new abode a sense of permanence. Shoot for a delightful mix between old and new, his and hers, deep hues and drama, or light touches, classical and modern.